“IS THIS YOUR card?” asked Marcus Millian III, holding up the nine of hearts. Marcus grabbed his mother’s hand and led her out of the kitchen into the dining room. The meatballs on her plate of spaghetti had been arranged to form the number two and a club. “You’re right. You’re right,” Mom said. Marcus had been testing a trick in which the picture frames on the wall in his father’s office would rearrange themselves to spell “DINNER.” It would require a fairly complex pattern of fishing line that he could manipulate from outside the room that he hadn’t worked out yet, and there were only enough frames currently on the wall to form “DIN,” but once it was perfected, he knew Dad would freak. Until then, Marcus would have to resort to walking upstairs like a primate to pass along the message. “Hey, Dad, dinner’s ready,” he said. “Thanks.” Dad saved the file he was working on, pushed back his chair, and stood up. “Got time for a quick trick first?” Marcus asked. Marcus shuffled his deck of cards, though it was a fake shuffle that kept the two of clubs on top. His favorite card was the jack of diamonds, but the two of clubs was easier to construct out of meatballs. “Cut the deck anywhere,” Marcus instructed. Dad cut the deck in half perfectly. Marcus frowned and furrowed his brow, pretending that the trick was ruined, and now it was going to be embarrassing and uncomfortable for everyone. Misdirection—one of the most important skills for a magician. Marcus set the two halves of the deck on the desk. “Look at the top card, but don’t show it to me,” said Marcus. Dad complied, taking the card and glancing at it. He thought he was looking at the card where he’d cut the deck, but he was actually looking at the top card of the full deck. “Stick it anywhere in the deck,” said Marcus, and Dad slid the card back in. Marcus did a full shuffle. “Would you like to shuffle it yourself too?” he asked. The order of the cards made no difference now, so he’d let Dad think he had more control over the outcome than he really did. “Sure.” Dad gave the cards a quick shuffle and then handed them back to Marcus. “No big deal. It’s all about practice,” Dad said. They went downstairs and sat at the dining room table. Marcus sat there stunned, staring as Dad had three more bites. Grandpa Zachary was actually Marcus’s great-grandfather, who went by the stage name Zachary the Stupendous. Now eighty-nine years old, he’d retired twenty years ago and was mostly forgotten in the world of magic, but Marcus idolized the cranky old guy. Hello. 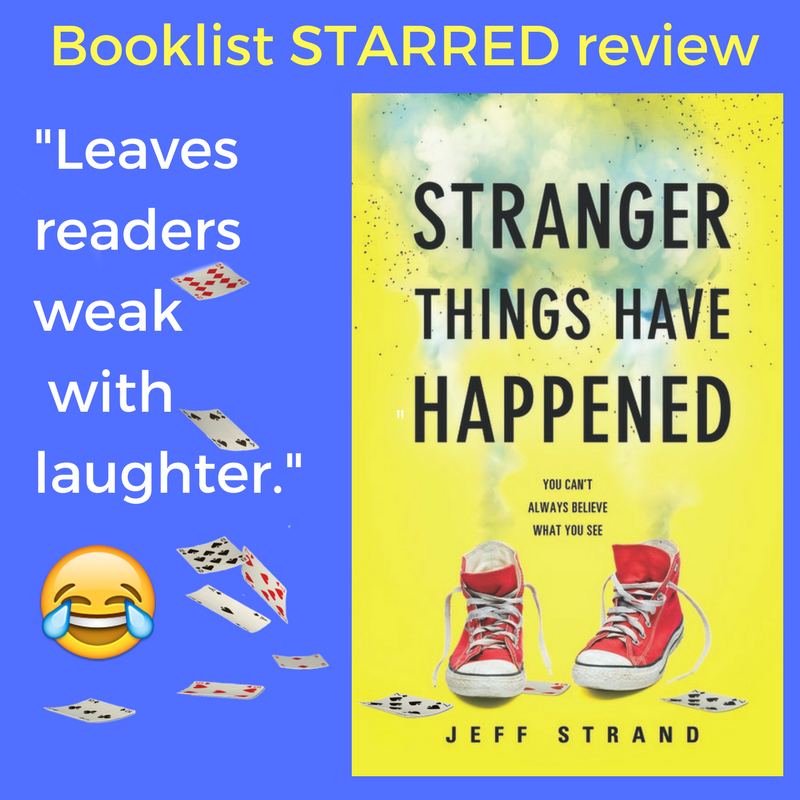 I'm author Jeff Strand. 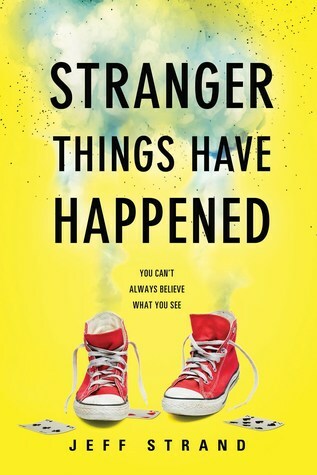 If you tolerated A Bad Day For Voodoo, were ambivalent toward I Have a Bad Feeling About This, and had little or no opinion regarding The Greatest Zombie Movie Ever, I'm pleased to announced that you'll be equally unenthused about my latest YA novel, Stranger Things Have Happened. It's an extremely silly comedy about 15-year-old Marcus Millian III, who aspires to be a legendary magician like his great-grandfather, Zachary the Stupendous. The problem (well, the first problem of many) is that he suffers from paralyzing stage fright. That's a bit of an issue when you want to be a stage magician. Some stuff happens, and Marcus finds himself part of a bet between Grandpa Zachary and his arch-nemesis Bernard. Marcus has to invent and perform a ridiculously amazing illusion that will astound the audience at Bernard's theater. Yeah, this is going to be a challenge, but at least he's got Grandpa Zachary to help him. Until Grandpa Zachary dies in his sleep. So now Marcus is on his own. Well, not entirely. He's got his neighbor (and secret crush) Kimberly to help out, along with the very socially awkward and heavily bullied new kid, Peter, who has...secrets. Together they will work to create the ultimate illusion, one that may or may not involve making a shark disappear from a tank in front of a live audience. Also, there's a really evil guy named Sinister Seamus. Watch out for him. Readers who are into magic (of the Penn & Teller variety, not Harry Potter) should enjoy this book because that's kind of what the whole thing is about. 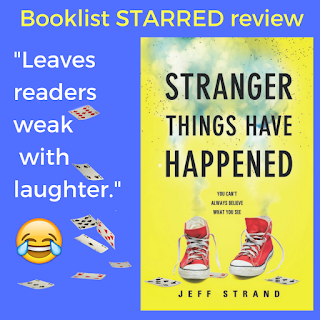 Readers who are into books that are filled with silly (some might even say stupid) jokes should also enjoy it. It's also about overcoming obstacles and following your dreams, if that's the angle you want to play.